We have the largest stock of backup pads for resin fiber discs in North America. If you don't see what you want, call or Email us. Download 12 page backup pad catalog. Backup pads for resin fiber discs are available in three styles. All pads ship with the mounting nut included in the package. "Smooth face" pads for general purpose applications. 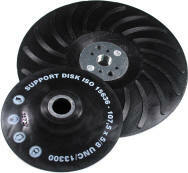 Select the diameter that matches your tool and disc diameter size. 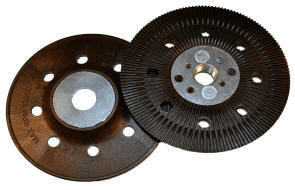 "Ribbed Pads" are fluted for more aggressive grinding and sanding. The air intake holes and ribs provide for air to flow under the resin fiber disc, promoting longer life. Click on the picture left for a larger image. 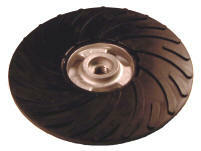 "Spirub" molded rubber pads with spiral flutes for air cooling. These pads have 5/8-11 threaded arbors to hold the pad on the tool shaft. They can be used with quick change style discs. These are professional grade pads for heavy duty applications. "Cool Flow Close Outs" We have a limited supply of our Cool Flow pads that have been replaced with our new air cooled ribbed face pads above. They are available at special pricing.